We know Spring is on it’s way, some day. While the sun outside is shining, the air is still a bit cold. We will continue our indoor activities with our literary favorites! This month at Sonnets Academy, our curriculum theme is, “It Was Once Written…” Our teachers have been introducing some of their literary favorites to the students. Some oldies and goodies include, Dr Suess’, “Green Eggs & Ham” as well as characters in the series, “If You Give…”, where we will meet some pretty adventurous animals, including mice, pigs and dogs. Also, don’t forget everyone’s favorite and hip, cat…Pete The Cat! Each class will be reading a wide selection of books that will set the theme for all their learning objectives - from our Music & Movement classes to Exploratory Art and Sensory Exploration! Sonnets Academy Teachers and Directors have had an exciting month of learning through literacy and imagination. This month we have also provided some Home/School connection tips to bring the learning home. Preschool students gather for circle time and begin their day with a story. Our River North PreKindergarten class works on counting and graphing. Reading to newborns and infant; do they understand what you are reading? They sure do! They might not know the words, but they are processing the sound of each syllable and the tone and inflection of your voice, so keep the pages turning! In fact, a wonderful way to soothe a squirmy newborn is to read them lullabies and nursery rhymes. The sound and repetitive rhythm of these tales will calm them. Infants will begin to recognize a song or rhyme if you repeat it often. We will use Pete and his shoes to inspire our older infants to try and place their shoes on their feet - a great fine and gross motor skill activity. We will explore the students creative side as we assist them in painting shoes with their feet. Infant Home/School Connection: It’s helpful to begin reading books to your infant that have one, two or three large images per page - as you read, let their eyes scan the figure and allow them to focus on the image. Use props and change your voice for each character to make it fun and engaging for your young ones. The mouse is in the house! Our Toddlers are following a classic children's series, “If you give….”, by Laura Numeroff. There are 17 tales in this series and each follows the hilarious adventure of it’s main character - sometimes a mouse, a pig or even a dog. Each story begins with one of the animals wanting an object and so begins a domino effect of associations, until the whole story comes full circle. Hmmmm….sounds familiar, very often our very own Toddles will see an object they want, and then very quickly move on to the next, next and next object. We love their energy and this series is perfect for their quick minds and fast feet. 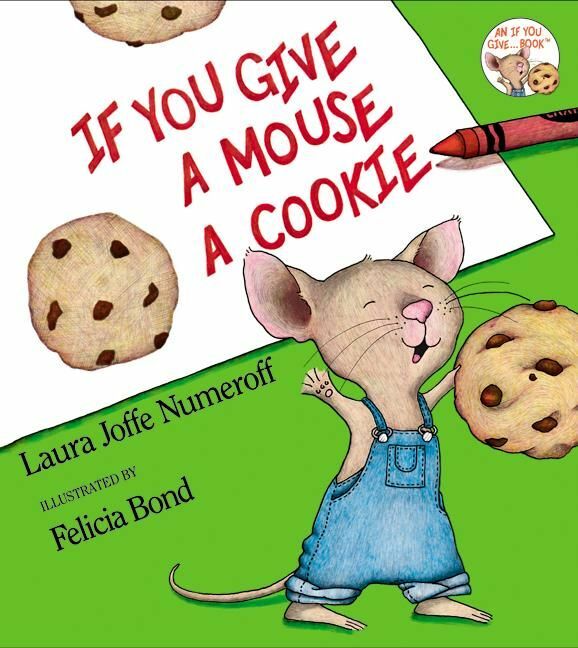 Our Toddlers will begin their day at circle time reading one of the books in the series - we’ll begin with “If You Give A Mouse A Cookie”. The mouse will set the learning objective for our day, we will introduce the letter, “M”, and practice coloring the letter. After each learning objective that day, we will circle back to our main mouse, very much like the storyline of the book itself. Sing along with our favorite mouse! Students created paper replicas of the mouse’s cookie. Yum! Toddler Home/School Connection: Listen and dance with your Toddler to the, “If You Give A Mouse A Cookie” theme song. Ask them about the character? What did the Mouse want? What sort of silly things happened to that mouse? These questions help your child retain the story and begin the lifelong practice of reading to learn. This month’s theme is perfect for our Twos classroom. When children enter their Terrific Twos, their language and vocabulary seem to expand daily, and they are eager and excited to learn more words. Who better to keep up with these ‘Terrific Twos’ then the amazing Dr. Suess! We’ll begin our literary journey with, “Put Me In The Zoo”. This adorable leopard is a colorful species with a beautiful coat of rainbow dots. This is a perfect way to introduce our letter of the week, “Dd”! We will explore all things colorful to match our technicolor leopard. We will be creating rainbow spotted leopard puppets complete with furry little pom poms (a great fine motor skill for Twos) and play color themed games like Simon Says! Twos Home/School Connection: We will be exploring a lot of wonderful reads by Dr. Seuss! Take a stroll to the library to check out some of Dr. Seuss’s work such as, ‘Thidwick the Big Hearted Moose’, ‘Oh The Places You’ll Go’ or his famous ‘The Cat in The Hat’. Have a movie night and snuggle up on the couch and watch, The Lorax. Check Out A Preview of the Movie, The Lorax. Twos will also be reading Dr. Suess' other classics, such as, "Green Eggs & Ham" and "One Fish, Two Fish, Red Fish, Blue Fish". Our Preschoolers are on the case! 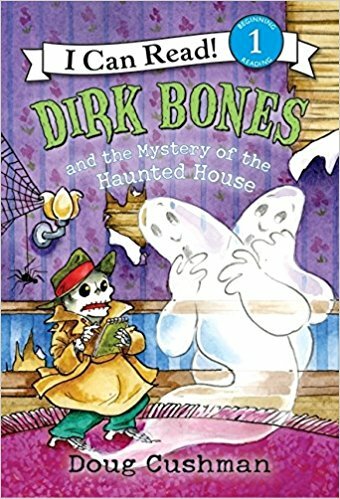 Preschoolers began their literacy unit with a mystery series, "Dirk Bones and the Mystery of the Haunted House!” The students loved this new type of genre for reading, and really engaged in the mystery theme when integrated into their daily curriculum. Teachers also integrated our mystery theme to our exploratory art classes. Students were asked to think of a mystery story, then they dictated their story to a teacher and they illustrated their story! Students participated in a mystery math game! Teachers prepped posters with number lines 1-10. The teachers then covered some of the numbers with a post it. The students were asked to figure out what number was hiding. The teachers showed the students some strategies to use for this process like checking the numbers before and after the mystery number, and counting. Preschool Home/School Connection: Their love of books continues and now they are able to sit for longer stories as well as remember and understand more complex books. They also like to retell the stories they have heard at school. Ask your preschooler to retell or act out one of the characters from a tale they’ve read in school. They might not always get to the end, and the story might be a bit out of order, but it will always be entertaining! Teachers reviewed how to count by 5s and how to say the word "stick" in sign language. The students discussed how their bridge was similar to the one that we read about in our book. At the age of 4 and 5, kids love to tell long stories and they are speaking in the proper tense - past, present and future. It’s amazing to see how much their vocabulary has grown since preschool! PreKindergarten Home/School Connection: Now that your child is moving closer to the age of five, they may start to enjoy being read chapter books. Ask your teacher what chapter book would be a good fit for their age. Help them make their very own bookmark and read one chapter to them a night. After reading, let them place the bookmark where you left off, you will be amazed how much they retain from the story and remember - be ready to answer lots of questions. Using rhythm sticks we will make different sounds for our infants - from soft to loud and slow to fast. We will also incorporate movement - tapping the sticks up and then down, the children will follow the taps of the sticks, this exercise encourages the infants to track motion and sound. The parachute is a class favorite! As we begin class, we will gather in a circle and either sit or stand around the parachute. We will listen to the song of the week and walk around the parachute as we sing or lie under the parachute. We will call out colors all the bright colors we see. This lesson promotes awareness of compound/isolated body parts and movement as we dance and move to different music. Our older students are preparing for Spring showers by singing ‘Pitter Patter Raindrops’! We will be learning the different things we can do with rhythm sticks and why they are called rhythm sticks. Students will be given half sheets of paper to learn to create raindrop sounds with their sticks. This lesson fosters music appreciation and instrument recognition as we try and replicate sounds. This month our infants will be singing songs about spiders, butterflies and ladybugs. We will use our collection of colorful soft animal and bug toys to engage the infant’s vision and sense of touch. Through repetive sound and words, sound recognition begins to form for out little ones. ¿Que bicho es este? / ‘what bug is this?’ Señor Hamlet will begin with a blank sheet of paper and then draw different bugs for the students to describe. The children will answer in Spanish what type of bug is being drawn and describe them using their vocabulary words. Using a butterfly mesh habitat, students will choose a buttefly and show the class. We will discuss the color of the buttefly and sing our butterfly song, all en español!